Jim Jarmusch's "Dead Man" is a pristine and delicate mood piece -- or, at least, as delicate as a movie with such alarming incidents of violence can be. Surely it wasn't his intention, but Jarmusch, in opting for black and white photography (world-class D.P. Robby Müller did the honors, in a portfolio of lush, stark beauty that warrants inclusion among the all-time finest achievements of cinematography), found a way around the MPAA's overactive gag reflex. Certainly such images as a fresh corpse's skull crushed under an assassin's heavy boot, followed by a sprightly dual jet of blood through the nose, would have dared an NC-17 rating if shot in color. The first five minutes -- the deceptively lugubrious train journey of William Blake (Johnny Depp) to the hellish town of Machine, where an accountancy job supposedly awaits him -- show you exactly why Jarmusch dismissed color this time out. Jarmusch must've seen how much fun David Lynch had with b&w portraits of ancient chugging machinery in The Elephant Man and decided to join in. Watching the black steam of the engine befouling the gray-metal sky as rusty gears churn, you may forget to breathe as you realize how seldom you see true examples of black-and-white artwork at the movies these days. Blake sits through the train ride, sometimes glancing out the window, sometimes leafing through a pamphlet with odd advertisements, often nodding off (the movie keeps helpfully fading to black, as if turning the lights out for him). Your first indication that this is a Jarmusch movie, and not just a radical change of milieu, is Crispin Glover's appearance as a soot-covered engine worker who sits across from Blake and expresses bottomless hostility while barely maintaining a poker face. Blake arrives in Machine, where a towering Robert Mitchum (in his final screen performance -- a good one to go out on) points a rifle at him and denies any such job waiting for him. The dejected Blake detains himself at a boarding house with a tenuously reformed whore (Mili Avital); they are interrupted in bed by her estranged beau (Gabriel Byrne), leading to gunplay that results in two and a half corpses. The half corpse is Blake himself, carrying a bullet in his frame not deep enough to kill him outright but too deep to dig out. The latter fact is discovered by Nobody (Gary Farmer), an Indian who happens across Blake's unconscious body. Nobody, it turns out, is a scholar of poetry; hearing Blake's name, he takes the white man for the William Blake -- "You are a poet and a painter, and now, William Blake, you are a killer of white men." Blake isn't inclined to argue. He's been a nobody himself; now, at least, he gets to be somebody, even if it's somebody else. The movie proceeds slowly and digressively, like an Anthony Mann Western chilled out and left to thaw, wedded to a drizzly and mournful fuzz-guitar score by Neil Young; sometimes you feel it should've been titled Deadpan. 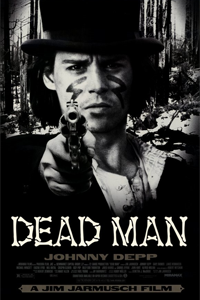 As if to compensate for the inexpressive-by-design Depp (few actors can do as much with as little facial animation as Depp can) and the stoically bemused Nobody, Jarmusch fills this text's margins with antic performers -- Iggy Pop, Billy Bob Thornton, and Jared Harris turn up, bickering around a campfire; Alfred Molina, a smilingly racist trader who offers Nobody pox-ridden blankets and obsequiously seeks Blake's autograph; Lance Henriksen is a cartoonishly vicious assassin, with Michael Wincott as his partner, filling the air with raspy, inconsequential observations. For a while the narrative plays out as a collection of anecdotes, a horseback road movie; then, as Blake draws nearer to death and makes it to Nobody's village, Jarmusch goes all the way into mysticism and absurdity. I know (and have read) several people who have no patience for the elaborate dawdling in Dead Man. It's true that if you attempt to catch it at too late an hour, you may nod off along with Blake -- that opening sequence is a test. But both times I've seen it, I was held by Depp's transformation from white-man non-entity to the Jarmusch version of the affectless Man With No Name, blandly asking an antagonist "Do you know my poetry?" before delivering a short lead haiku. Physically beautiful, temperamentally reflective, "meaningless" scene for scene until you ponder it afterward, the film is itself a poem -- a meditation on death that shrugs at life but then moves beyond a shrug. If you have the stomach for its wanderings, and its "poetry written with blood," this is an original and masterful achievement. Dead on the surface (even the photography has the grim authority of the slab), it comes to life, vampire-like, in your head days later.